It wasn't easy for Archie, Betty, Veronica, Jughead, and Reggie to form their band. Things eventually fell into place and their passion for music brought them together. With 'The Archies' we get a more focused narrative involving our favorite Archie characters. And it's more in line with classic Archie Comics than the current main series. It makes a great companion series though and the results are a joyful examination about friendship and music. 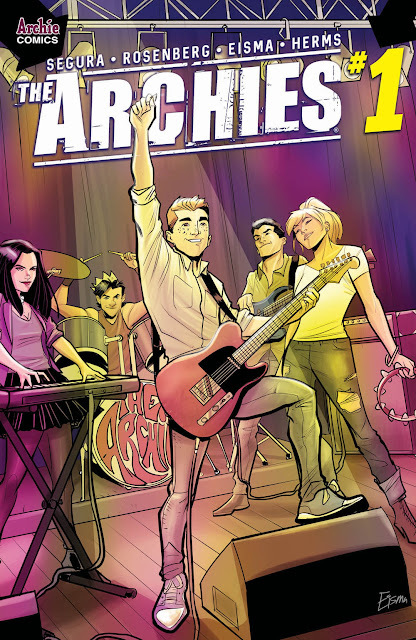 Writers Alex Segura and Matthew Rosenberg put Archie through what I suspect most young bands go through. Fretting over the next gig, the anxiety of playing to small crowds, worrying if everyone will show to rehearsal, the pressure to write another great song, and finding the motivation to do it all. Archie breaks the fourth wall to engage the reader as well as using Jughead as a sounding board. Jughead in his most subversive way, whether intentional or not, steers Archie to the answers he's been looking for. It's kind of an epiphany and a reminder about what makes this whole experience worth it - jamming with friends. Joe Eisma must be having a ball drawing these exuberant scenes of bands rocking out and the crowd going wild. It's a party vibe that transcends the page because of what it means for Archie to see it. Eisma has been doing such clean and expressive work it's exactly what you want from an Archie book - fun and effusive. Matt Herms' rich bright colors make everything pop and a joy to take in page after page. 'The Archies' is off to a great start. It's an engaging and charming rock band adventure that will put a smile on your face. Archie and the gang are just getting started and the creative team is just as stoked and that bleeds through the page. Look for Easter eggs that inspired the band as well as the creators. This is the feel-good version of 'Behind the Music' without all that pesky heroin use and shady groupie encounters.